Bodegas Lacus (DOC La Rioja) was founded by Luis Arnedo, an energetic man with a profund love and respect for the roots of his native landThe word Lacus derives from a pond made out of mother rock in which it is used to crush the wine grapes. This is a small winery with low production. They have around 20 ha of vines, distributed with Tempranillo, Graciano and Garnacha. The vinification method of Inedito is very artinasal. For instance, the berries are manually picked and carefully selected usually in mid to late September. Afterwards, the grapes are given a cool maceration treatment for ten days & fermentation happens in temperature controlled stainless steel tanks. Finally, the wine is aged in stainless steel and is bottled nine months later without fining or filtration. Inedito is a very fun wine to drink. With its opaque colour, the wine displays beautiful nuances of licorice and violet. On the mouth, the wine has very good acidity and very accesible tannins. Its flavors remind of red cherries with petal roses with time shedding away and given place to black pepper and smoke with old, cured leather and lots of minerality. Bodegas Lacus is represented in Quebec by Vini-Vins. Along with Moraza producer, there are two of my favorites natural producers in Riona. Inedito sells privately in case of 12. For under $25, it is a steal. Ribeira Sacra is becoming one of the hottest areas in Spain. The Mencia grape is creating a storm in the area. One of the most exciting wine projects is Silice Viticultores. This is a new winemaking project of brothers Juan and Carlos Rodríguez with Fredi ‘Fresquito’ Torres. The idea of this venture was to go back to their roots. They are 3 passionate people of Ribeira Sacra that in 2013 realized their dream of making the finest and elegant wines of Ribeira Sacra. Their vineyards are located in the extreme part of the subzone Amandi. Their winemaking and viticultural philosophy is artisanal in nature with the most respect of their environment. From the beginning of the project, they did decide not to adhere to the d.o. Silice makes 3 wines under the name Sílice. One is Sílice, a wine that is born from old mencia grapes with an average age of un vino 60-80 years old. The grapes are manually selected, and made only in the inox cuvee. On the other hand, there is the Selección Especial, which comes from the same parcel but from different subzones , Both of the wines are made with the stems and aged for 12 months in barriques of 300 litres of different ages. They are both called 302 and 301. They are mostly mencia monovaretials. The group draw their inspiration of making wine from the Burgundian model of winemaking, that consist of letting each parcel express their own personality. The basic Silice 2013 was made only with the Inox Cuvee but in the future they plan to use wood foudres. This is due since the Mencia grape presents a lot of reduction problems and just the inox do not help the situation. And to conclude Silice is biological tending towards biodynamic viticulture. Ribeira Sacra Silice 2013 Inox ( Around $26. Private import. Caise of 6. Vini-Vins). An incredible exquisite and crispy wine born from granite soils in Ribeira Sacra. This wine has a prodigal red fruit character. If i have to compare, it reminds me of the Morgons of Marcel Lapierre. On the mouth, the wine has a sensual and subtle fruit expression verging toward a Pinot Noir profile. Very easy an incredible to resist now but could age easy for the next 5-years. 93\100. Perfect for the warm summer nights. Is Sierra the Gredos, the new eldorado of Spain? Every once in a while, I come across undiscovered gems when I buy wine in the private importation network of Quebec. This ocurred to me a while ago. I was browsing through the list of current release of one my favorite agencies, Vini-Vins, when the name of Comando G stroke my eye. Since, I never heard them, i started doing a bit of research. 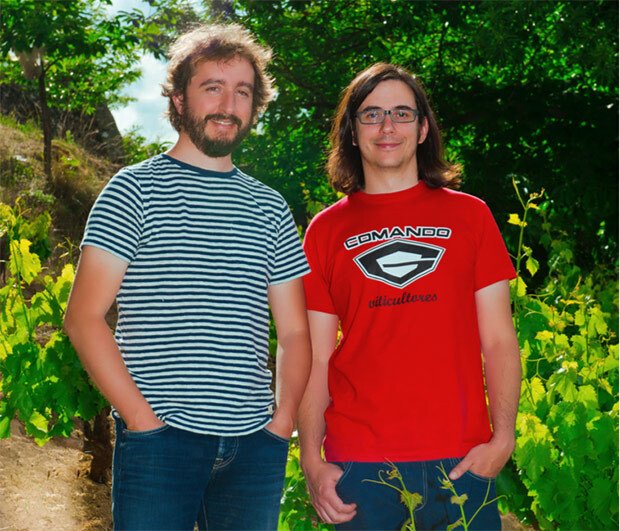 Comando G is a joint venture between two young and upcoming spanish winemakers, Fernando García (Bodegas Marañones) and Daniel Gómez Jiménez Landi. The pair discovered a very singular vineyard which was the highest in the D.O Vinos de Madrid. It has an altitude between 900 and 1,100 meters in the Sierra de Gredos mountain range. 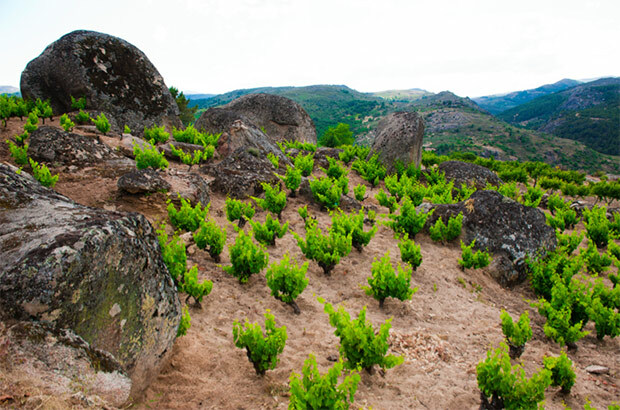 This tiny vineyard consist only of 3 ha of very old vineyards in poor granite soils. From there, they started scouting other vineyards in the Gredos mountain range and they now they have close to 10 ha of very old garnacha between the ages of 50 and 80 years old. They farm biodinamically and this energetic duo have a passion to rescue abandoned vineyards and restore the agriculture tradition of the area. I can draw the comparison with the work that Alvaro Palacios in the Priorat was doing in the beginning of the 90’s. In the US, the proyect has already been discovered by prestigious wine importer Eric Solomon. In a recent article ( In Search of a wine with a star quality) by Lettie Teague of the Wall Street Journal, Solomon praises Comando G as being one of ” the most exciting new projects in Spain today.”. Miss teague also comments by saying that the wines of Comando G are like a meeting Burgundy and Rhone Valley in high altitude Spain.I can relate with Miss teague wine description, as i found in their entry level wine, Las Brujas Averias many elements that were present in a southern Rhone wine. But i was, the purity of the red fruit that strikes the most. I can see why Miss teague is reminded by Burgundy. Las brujas, makes me already think of a entry level Volnay. But anyways, I can getting ahead of myself. 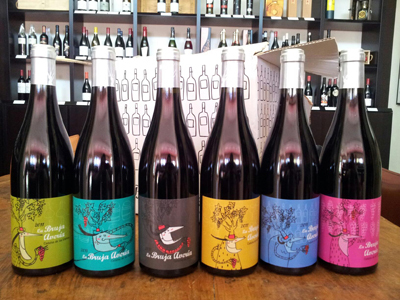 The label design of Las Bruja Averia, a witch in different poses and different background colours-each bottle is different draws its inspiration from Japanese and Spanish animation cartoons. The idea of this two young winemaekrs is to take out some of the snootiness in the world of wine. La bruja see 7 months in barrel aging. Their entry level wine is easy to drink but quite complex too. They also make different single vineyards bottling such as Rozas and Umbrías). They also make two special bottlings called Rumbo al Norte and El Tamboril 2012.Vini-Vins, their representant in Quebec carry all of the cuvees except for las Rozas. La Bruja Averia 2013. D.O Vinos de Madrid.